The AALS Handbook sets forth the Association’s governing documents and policies, and organizational structure. It includes the Association’s Bylaws, Executive Committee Regulations, Articles of Incorporation, and Statements of Good Practices, among other documents. 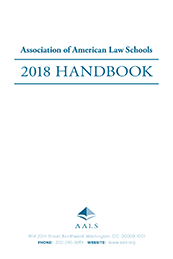 Members and fee-paid schools receive a limited number of copies of the handbook as part of the annual dues or service fee paid to the AALS. Additional copies may be ordered for an additional fee. Bylaws of the Association of American Law Schools, Inc.